It's delicious. 6 yummy bakes. Made with real fruit. Whole wheat flour. Suitable for 12 months+ to grown ups. Soft, baked bars for little mouths. Encourages self feeding. No added sugar and salt. No artificial flavours, colours and preservatives. Suitable for vegetarians. Our delicious Fruity Bakes are bursting with a yummy real strawberry fruit filling with no added sugar in a soft golden baked whole wheat flour crust. Individually wrapped in perfect snack sized portions, our Fruity Bakes are great for topping up your little one wherever you are - go on try one yourself. 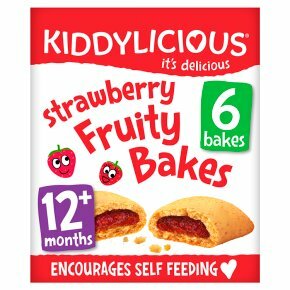 KIDDY CARE: Kiddylicious Fruity Bakes are specifically developed for children from 12 months.<br>Always supervise young children whilst they're enjoying them.